Dine Out For Days! Dine Out Boston is Back! 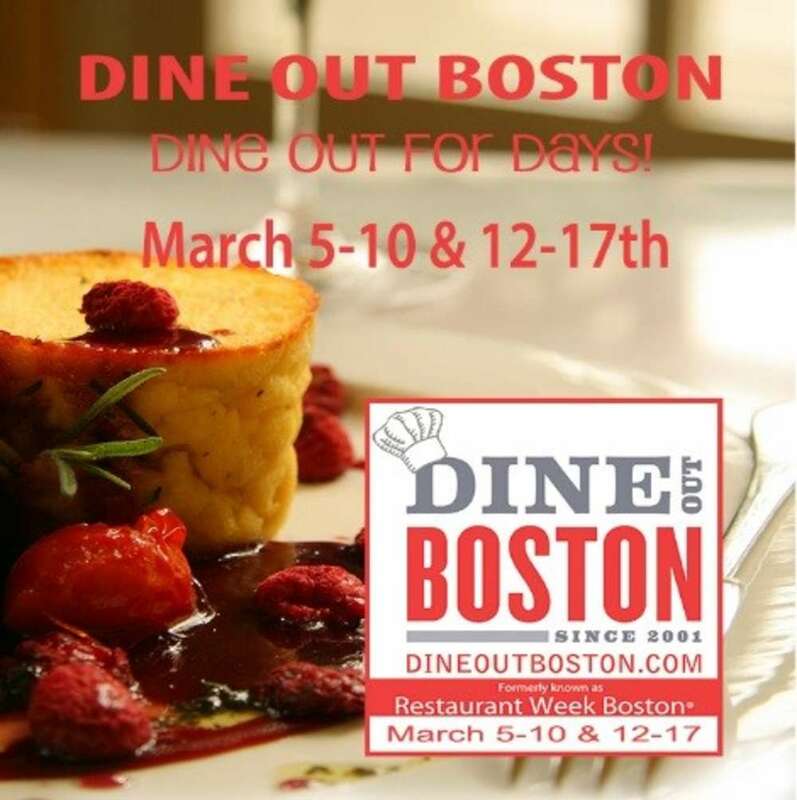 Dine Out Boston® (formerly Restaurant Week) is back on the menu March 5-10 & 12-17! Visit dineoutboston.com to see over 150 participating restaurants, browse menus and make reservations. Sponsored by the Greater Boston Convention & Visitors Bureau (GBCVB), in partnership with American Express, Dine Out Boston is celebrating its 16th year of providing diners an opportunity to enjoy the region&apos;s dining scene, and restaurateurs the chance to bring in new guests. This two-week celebration showcases Boston’s diverse restaurant scene. During the two weeks of Dine Out Boston, diners have numerous choices as they enjoy Greater Boston&apos;s finest dining coupled with significant savings. The program’s flexible pricing structure benefits restaurants and guests alike. Restaurants can customize their lunch and dinner menus by choosing price-points: lunch for $15, $20 or $25 and dinner for $28, $33 or $38. Restaurants can offer as many courses as they desire at their selected price! Over 150 exceptional restaurants in the Greater Boston area will take part, including new participants Menton, Ruka and Doretta Taverna in Boston, as well as Puritan & Company and The Smoke Shop in Cambridge. Delicious new additions can also be found in the suburbs, where Real Italian Gusto in Medford and Nosh & Grog in Medfield are first-time participants in Dine Out Boston. This March, social media mavens are once again invited to share their #dineoutboston pictures on Instagram for a chance to win $100 gift cards to participating restaurants. Follow GBCVB social channels to learn more. "Dine Out Boston spotlights Boston as one of America&apos;s premier culinary destinations, providing patrons from Boston and afar with a unique opportunity to enjoy exceptional value, variety, and hospitality in Greater Boston restaurants," said Patrick B. Moscaritolo, President & CEO of the GBCVB. “Diners are invited to take advantage of these restaurant deals while taking in seasonal activities – a concert, theatrical performance, museum exhibition, or a game at the Garden, coupled with a Dine Out Boston meal, makes for a classic Boston experience!" Since 2012, the GBCVB has used this dining program to give back to different local Boston non-profits each year. To date, over $350,000 has been raised for charities through the online auction component of DOB. The charitable partner for March 2017 is The Fund For Parks & Recreation In Boston. The Trust Fund created in 1983 provides support for maintaining and preserving city parklands and providing recreational programs to city residents. Gift Certificates provided by participating restaurants will be up for auction starting March 6, with proceeds benefiting The Fund For Parks & Recreation In Boston. Dine Out Boston is a bi-annual value-driven dining program founded and presented by the Greater Boston Convention & Visitors Bureau and American Express. Formally known as Restaurant Week Boston®, the program is now in its 15th year of offering exclusive savings throughout the region&apos;s top restaurants. During Dine Out Boston diners can enjoy a chef-customized lunch or dinner for a fraction of the normal dining cost. Due to high demand, reservations during Dine Out Boston are encouraged and can be made in advance at www.DineOutBoston.com. For more information or to inquire about having your restaurant involved in Dine Out Boston® please visit www.DineOutBoston.com. Check out Dine Out Boston on Facebook at www.facebook.com/dineoutboston, Twitter at www.twitter.com/dineoutbos, and Instagram at instagram.com/dineoutboston.